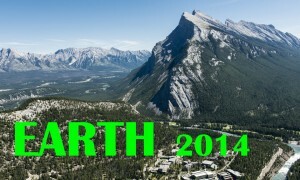 The Symposium on Earth was the fourth national meeting organized by the Humboldt Association of Canada (HAC). The Symposium registration, at approximately fifty scientists, was similar to registration for the previous three Kollegs. The first HAC national event, the Symposium on Water, was also held at the Banff Centre in Banff, Alberta in 2005. The programme of the Symposium centered on the theme of Earth. The invited keynote speakers (Prof. Dr. Helmut Echtler, Universitaet Potsdam; Prof. Dr. Inga Moeck, University of Alberta), addressed the broad theme, EARTH, from geological perspectives, but skillfully translated their special knowledge to engage the interests of everyone present. Proffered presentations by delegates rounded out these themes by introducing philosophical, sociological, paleontological, chemical and engineering views of ‘Earth’. The program included both full assemblies and concurrent sessions, and with ample time for discussion following individual papers, over refreshments and at social events. One highlight of the Symposium was the participation of Consul-General Sitz (Vancouver), who opened the Symposium and participated in all aspects of the program. The opening session served not only to welcome the delegates, but also to outline Humboldt-oriented activities in Canada – Professor Kennepohl describing the objectives and activities of HAC the Humboldt Foundation Liaison Office Canada (HFLOC). Dr. Chow read out a letter of welcome sent by Dr. Amian (AvH, Bonn). The Symposium again provided a rare opportunity for HAC to hold its Annual General Meeting (AGM; required under incorporation regulations) with nationwide participation. The AGM was called to order by HAC President Kennepohl at 08:30 May 11, 2014. A quorum of thirty members was declared. Discussions centered primarily on the need for improved promotion of HAC and the national HAC Symposia, intra-HAC communications and even constitutional issues. Officers elected (all by acclamation) included Prof. Chung-Wai Chow (President), Prof. Anshuman Khare (Treasurer), Prof. Siegfried F. Stiemer (Webmaster), Prof. Leonard I. Wiebe (Secretary), Prof. Dietmar Kennepohl (Past-President) and Prof. Rolf Mathewes (Vice-President). (Excerpt of the Secretary’s Report, Leonard I. Wiebe).